« ID Epi Seminar Series: Anne-Catrin Uhlemann, MD, PhD, Columbia Univ. Talk title: Can household-targeted interventions meaningfully reduce the risk of TB infection and disease risk in high burden contexts? 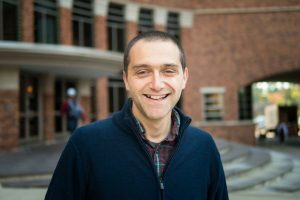 Biography: Jon Zelner is an Assistant Professor in the Department of Epidemiology and Center for Social Epidemiology and Population Health at the University of Michigan School of Public Health, and he received his PhD in Sociology and Public Policy from the University of Michigan in 2011. Prior to returning to Michigan in 2017, from 2011-2014 he was an NIH RAPIDD postdoc with Prof. Bryan Grenfell in the Dept. of Ecology and Evolutionary Biology at Princeton University; from 2014-16 he was a Robert Wood Johnson Foundation Health and Society Scholar at Columbia University, and in 2016 he was a postdoctoral fellow with Prof. Ted Cohen in the Dept. of Epidemiology of Microbial Diseases at the Yale School of Public Health.